For many educational establishments and companies, where computers are an integral component of equipment, there is a pointed need for plenty of computerized workplaces. Actually, allowing 2 users work on one computer is one of the most convenient ways to make many related tasks easier and save your money and space at the same time. If you are requiring far better productivity from your computer allowing two users work on the same PC simultaneously, you’ve come to the right place! IBIK company is proud to offer you ASTER – a professional dual monitor program designed to double your workspaces by allowing usage of one computer for two users and even more. Actually, ASTER is currently used all over the world for equipping workplaces in libraries, schools, accounting departments, Internet cafes, offices and other establishments. This advanced dual monitor program makes it possible to use one computer for two users as if they were each using their own computer. There is no hardware needed: just connect an extra monitor, keyboard and mouse to the available shared computer and ASTER will allow two users work on one PC at the same time. 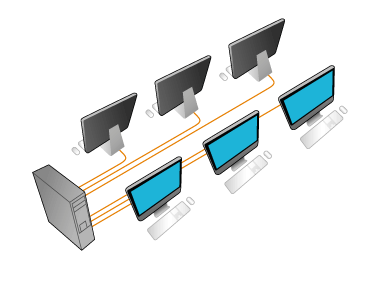 By allowing 2 users work on the same computer, you can count on increased productivity and more organized work as several users can simultaneously perform different tasks on each of the monitor while having shared access to common devices like the printer and scanner attached to the main computer. ASTER is a reliable dual monitor program that allows running one computer for two users without using thin clients and terminal stations while ensuring stable operations with a standard set of office tools and other applications. If compared to using different computers, ASTER ensures a better value for your money. By creating several workstations from a single physical computer box, you are able to optimize your office space and productivity without large initial investments.